DISCLOSURE: I received a free package of GoGo squeeZ from Smiley360 to try and review. 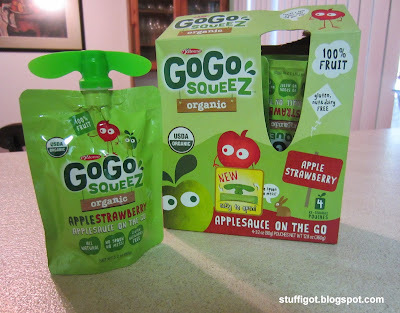 My boys love GoGo squeeZ applesauce pouches. We've been buying them for a couple years now. They're perfect for packing in your child's school lunch or snack and great for bringing with you on the go. 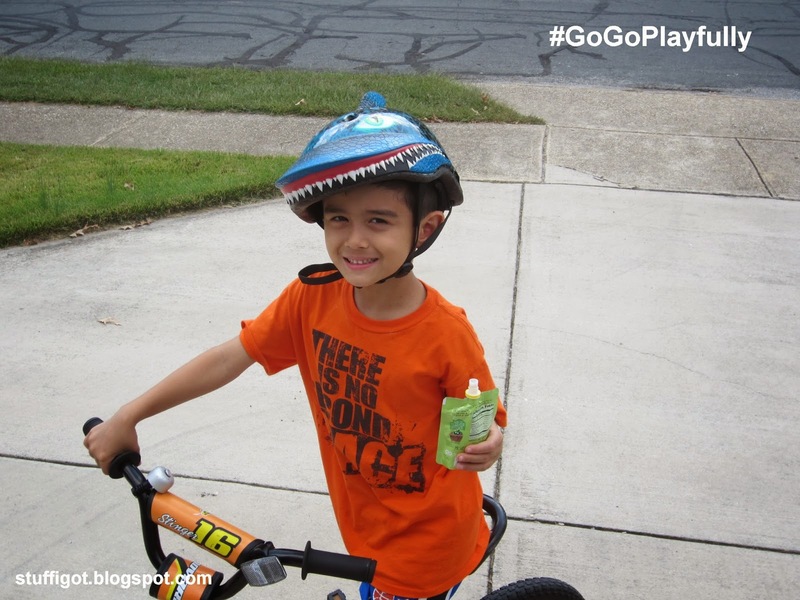 GoGo squeeZ is a great, on-the-go snack that makes it easy for your family to enjoy life’s moments of fun and laughter without having to stop! 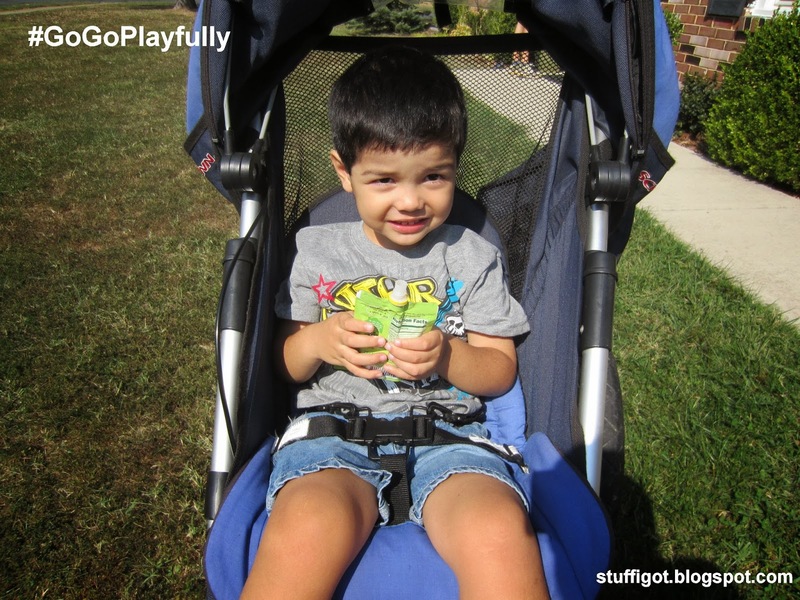 GoGo squeeZ encourages you and your children to #GoGoPlayfully! 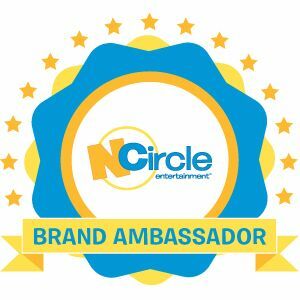 They've created a Playlist of fun, outdoor activities to do with your family, like a Backyard Obstacle Course or Frisbee Golf! 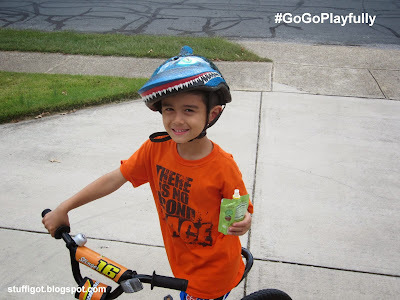 My six-year-old loves to snack on GoGo squeeZ pouches while he's out riding his scooter or bike. And here's my three-year-old before he went out on a run with my husband. GoGo squeeZ also now features a new cap. It makes it so much easier for even young kids to open. When we packed the applesauce pouches in my kids' lunches, we used to have to open it first and then reseal it before putting them in their lunch bag. Now, even my three-year-old can open it! Plus, the new caps use 40% less plastic than the old ones! Definitely! My kids love them and so do I! They come in a bunch of different flavors and are a great, healthy snack. How much does it cost? A 4-pack retails for about $3. You can usually find single pouches for about 99 cents. Where can I buy it? 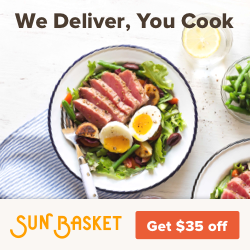 You can find it at mass merchandisers, natural food stores, grocery stores and online retailers.